Good luck! Comments will be allowed for this giveaway from now through December 15 until 6 pm MST. A winner will be chosen randomly that evening and will be notified via email. Please make sure you are not a "no reply blogger" so that I can contact you. My favourite book is Slave to Sensation by Nalini Singh. It's the first book in an amazing series. Your work is amazing! I'm a new quilter and am so inspired by your sampler, the basket and all the other beautiful things in your collage! My favorite novel is An Episode of Sparrows by Rumer Godden, a very old book that I first read in the 60's, when I was a teen and have re-read once or twice. It was made into a film, The Innocents, which I'd like to view someday. Love the coat you made! It has seemed like forever since I have been able to read a book. I truly miss it but I do get out my Kaffe Fassett quilt books occasionally just for a bit of eye candy. Thanks! WOW, what beautiful projects! I love to read...raising 5 kids doesn't leave me much time to read these days, It's hard enough to find time to sew all the things that I want. That being said, the Princess Bride may be my most favourite book ever. My oldest daughter just finished reading it for the first time, and I think that I will have to make time this Christmas vacation to read it again. I am currently working on a Tula Pink quilt for my mom featuring the blues of Saltwater! I don't think I have a favorite book....I love looking through all sorts of different books to get creative inspiration though! Picking a favorite book is like trying to pick a favorite fabric. I just like them! One my favorite picture books is The Marshmallow Incident. I have a couple books with classic block patterns. I'd love to do a modern sampler someday though! I have to favorite books, Reader's digest Complete Guide to Sewing and their complete Guide to Needlecrafts. Love these books. I'm re-reading American Gods by Neil Gaiman. I've been one of those quiet followers for some time. Love your blog. It is too hard to pick a favorite book as I have a few and love them all. My favorite novel is The master butcher singing club by Louise Erdrich. I love the "Pattern Magic" books, they are amazing. I'm loving Fat Quarter Style right now! I don't really know, but I would like to have the Farmer's Wife! Thanks for the chance to win! My favorite book...anything by Jodi Piccoult. My favourite book ever is a non-fiction book written by Victoria Finlay titled "Colour: Travels Through The Paintbox"
I reach for my Material Obsession books whenever I need inspiration. I can never pick a favorite book but the novel Heading Out to Wonderful is my favorite of the last half dozen novels I read. I've enjoyed the Elm Creek series about quilting. I like the historical ones the best. My favorite novel is Gone With the Wind. My favorite novel Redeeming Love, so good!! My favorite book is The Giver. Not exactly for adults, but still great :). Any chance you would share the name of the quilt shop where you found these fat quarters? I desperately need more for a project I'm working on. I love the novel Alice's Tulips by Sandra Dallas. It's beautiful. We can't seem to get Tula fabrics in this neck of the woods...I wonder why? I simply adore the first one since I am collecting fabrics with hexies on them. I think my fav quilting books would be the Elm Creek Quilters series. i like the white House Chef mysteries by Julie Hyzy - fun, quick reads and recipes. The Guernsey Literary and Potato Peel Pie Society by Mary Ann Shaffer is a wonderful book. Guilty as charged! Joined the Tulatroops all the way!! I love your question as I really need something new to read! The book that I go back to over and over again is Angela Walters Free Motion Quilting book. It not only has fantastic ideas (showing you how to make said motifs, too), but they are wonderful jumping off points, as well. And yup, that's me an "old" follower! Carol Doak's 50 paper pieced stars are very impressive and versatile, so I think I will put her down as my favourite sewing book. My favourite sewing book is the bag making bible by lisa lam. Ive learnt so much from that book. Love all of my quilt magazines. Thanks. Love Elizabeth Hartmanns books for a beginner. My favourite book is A Suitable Boy by Vikram Seth. I just started following you on Bloglovin. The Nell Fitzgerald series of novels are very entertaining! Fine Machine Sewing by Carol Ahles. It's so hard to pick a favorite book. I think mine will always be Dare to be Square by Boo Davis. It was the first quilting book I ever owned, and made the craft so accessible. I love To Kill a Mockingbird. And am also having a lot of fun with Tanya Whelan's Sew What You Love. The Secret Life of Bees is one of my favorite books. My favorite quiling book is called, Color and Design by Heather Thomas. Hello from Minnesota! My favorite sewing book is Storybook Toys by Jill Hamor. It's full of delightful soft toy and doll patterns, printed full size and with step details. I love the Amy Butlers bag sewing book! I have been reading some of the Elm Quilt books. Hi- I actually keep returning to Martha Stewarts Encyclopedia for Sewing any time I have a need for an idea or a question! Gosh a fave book? There are so many. I love anything by Elizabeth George. I also enjoyed The Time Traveler's Wife & The Immortal Life of Henrietta Lacks. Ha! The City Sampler book is my fave! I'm a lover of all things Tula Pink! Dare to be Square, great instruction and inspiration too. Love Tula Pink but haven't used very much of it yet. I also love your blog tagline . . . made me laugh because I relate so well. I have always loved Alice in Wonderland. I love the book The Shack. I have also read Red Tent several times. I'm not sure what my favorite sewing book is. Don't have a favorite book. Love them all! I have been using the wee wonderful sewing book quite a bit lately to make softies. I love the novel The Red Tent. My current fave quilt book is 501 Rotary Cut Quilt Blocks. So much inspiration! Still loving Sunday morning quilts. I loved Amy Harmon's Running Barefoot..sucha good book. That's a beautiful quilt! I'd pick Camille Roskelley's sewing book as a favorite. I'm fairly new but Quilty Fun is the best book so far! I love all the cute ways to sew! Thanks so much for the giveaway! I follow you on bloglovin! Thanks so much! I love all novels by Matt Ruff. Thanks! I follow you with Bloglovin. Thanks! I love Tula Pink, she is wonderful. My first book to buy regarding quilting and crafts was the Zakka book. I did the quilt-along and made lots of things from that book. My favorite book is The Elegance of the Hedgehog bu Muriel Barbery. I love the little calendar you have stitched. My favourite book series is the Alana books by Tamora Pierce. i recently bought 'zo geknipt' a dutch sewing book. That's the only sewing book i own. I love Material Obsession books! Thanks so much for this great giveaway! I'm your follower via bloglovin, Thanks!! Elizabeth Hartman's first book is still my go-to! My favourite book is usually the one I have just read provided it was good. I am rereading Maggie Alderson's Shoe Money. A collection of her newspaper columns which are hilarious. I love any of Bonnie Hunters books. She like to make scrappy quilts and I do too. Your projects are terrific. Thanks for the opportunity. I don't have a lot of sewing books. However, Pillow Pop is pretty great. I would say Bonnie Hunter books. Thanks for a chance to win. I would suggest any of the books by Susanna Kearsley. My favourites are The Winter Sea, and The Rose Garden. Your quilt is gorgeous. Sew much work went into that! My favorite novel is The Host by Stephanie Meyer. So hard to decide on a favorite book! Probably "The Chosen" by Chaim Potok. I like Elizabeth Hartman's books! I love looking at Kaffe Fassett's books and Angela Walters books. Thanks! Love to read anything by Jessica Day George and Shannon Hale. Currently reading Pegasus by Robin McKinley. Your fabric choices are amazing - as are your finished pieces! Wow! I'm new to sewing, so this giveaway is a fun way to find great blogs and inspiration. I am retiring in 8 days - so will have a chance to do more reading (and quilting!). 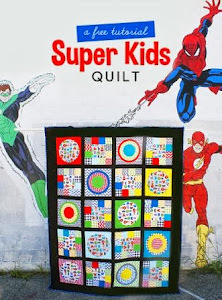 In the mean time, my favorite quilting books are any by Kim Diehl! I don't get to do a lot of reading but I think my favorite books are still the Harry Potter series. I am reading Worth Doing twice, and Timespan Quilts! Squeal -- Tula Pink. Great giveaway. My all time fave book is The Grapes of Wrath. It's so wonderfully written that I've read it about 4 times int he past 40 years. I am blown away by your gorgeous sewing! Wow. Wow! love your City Sampler quilt; great job! My favorite book is The Shadow of the Wind by Carlos Ruiz Zafon. I like the design quilt book "Modern Appliqué Illusions." I've not yet made a quilt (just got my machine last month), so I haven't looked at quilting books. My favorite novel is Sarah's Key. Thanks for the giveaway. My favorite sewing book right now is Patchwork City by Elizabeth Hartman -- haven't started yet but I'm getting ready! I don't really have a fave sewing book. I usually get patterns online or I look in my vintage sewing books that I just love. Thanks! I follow you on bloglovin'. Love that feather quilt! I like Big City Bags. I love looking through quilting technique books. 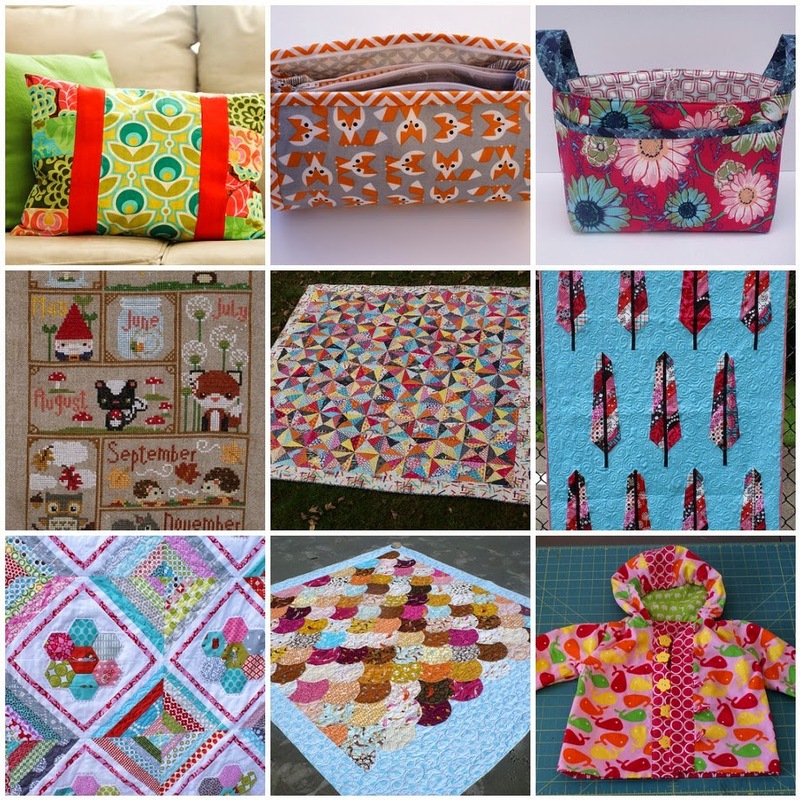 Weekend Quilts is my favorite...great ideas for fast quilts! I love your stuff...so pretty. My favorite book I have read is Orphan Train. Very interesting. I like all of Louise Erdrich's novels a lot. Picking a favorite book is really hard. Right now I am reading everything I have by Elizabeth Goudge; she was an English author who wrote mostly from the 30's through the 60's. My list of favorite sewing books is really long so I'll recommend a book (non-fiction) that was interesting and funny: "In a Sunburned Country" by Bill Bryson. My favorite sewing book? I have been sewing a lot of projects out of the Oliver and S book Little Things to Sew--but I would love to get a hold of some Japanese sewing books soon! I love any of Kaffee Fasset's books, and for novels I loved The Kite Runner, Gone Girl, and The Silent Wife. loving your tula pink quilt and am making my own with the 101 modern quilt blocks book! also a fan of kaffe fassett's books and denyse schmidt has a nice book with different quilted projects. i would love to win these fat quarters and even have a project they would fit right into! thanks for the chance. happy holidays! For favorite novels, I like the Longmire series and my hubby does too. I am a total Tula Fan! your collage makes me so happy, beautiful work. Anything by truly Camille Roskelley inspires me. Recently Angela Walters is becoming my go to author. I loved 'the Help', after reading the book the movie was a real let down. My favorite quilting book is The Modern Quilt Workshop. For quilting, I'm enjoying quilter's mixology. For fiction, there are just too many wonderful authors to pick a favourite. My favourite sewing book would have to be Sewing Clothes That Kids Love - I've made up almost every pattern in that book! I love the novel I'm reading now. i have only had time to read magazines in the last little while, I have gotten the last couple copies of Love Patchwork and quilting and quite enjoyed them. I love Pat Speth's book 'Nickel Quilts' - great basics! 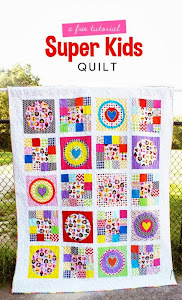 I love the Elm Creek Quilts series. Your projects are beautiful! I love Tula Pink fabrics! I am not reading much right now, but I am looking at magazines! I recently purchased Carolyn Friedlander's book, "Savor Each Stitch." I think it gives a different perspective than many quilt books which tell you how to replicate a specific pattern in one particular way. I don't have a favorite quilt book... or a favorite novel... but my favorite book is Harold and the Purple Crayon... always has been always will :)! I just started following your inspiring blog via Bloglovin. I love your projects and use of color! I like my Amy Butler sewing books. Your quilts and other projects are so colorful and beautiful. Thanks for the giveaway. My all time favorite book is Wind in the Willows. I'm reading it to my granddaughter right now. Thanks for the great giveaway. I love Tula Pink's designs. I really like Sunday Morning Quilts. Thanks!